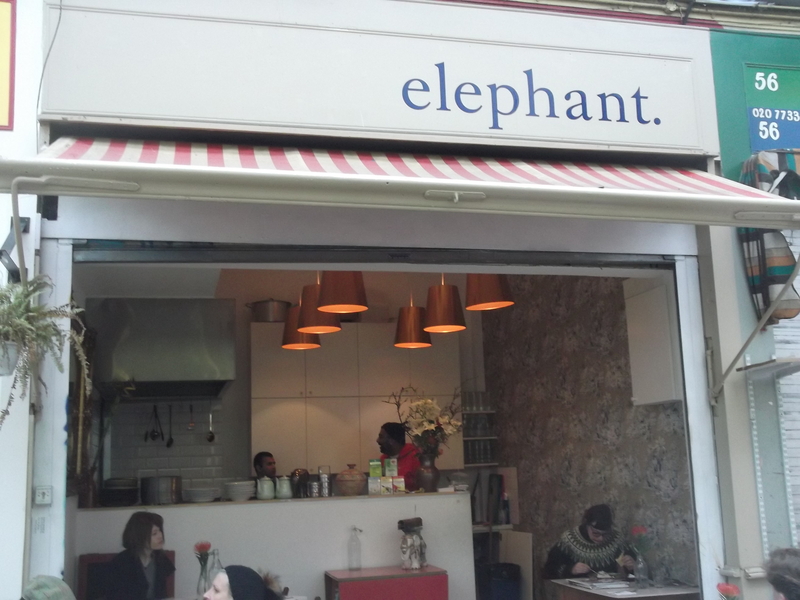 Elephant is a Pakistani cafe nestled in Brixton Village, it serves up a small selection of traditional sub-continental starters, thalis and curries. It opened only a couple of years ago and has received rave reviews in the Evening Standard and Time Out. The restaurant has an open front which is great for people watching but it does get a bit cold because the market is unheated. It is very small with about 18 covers spread over 7 tables and an open kitchen staffed by a single chef behind a high counter; the decor is clean and bright, with mismatched and reclaimed furniture (it looks nothing like your bog standard curry house). The menu is curt and inexpensive, with only a handful of options for starters and mains. I opted for the vegetarian samosas which were predominately filled with sweet potato spliced with aromatic cumin seeds, bound together by very rich pastry. They were the best samosas I have tasted during my three months of eating in London. I also opted for the veg pakora which had a dry spiciness and contained soft and sweet chunks of aubergine, complemented by curry leaves and morsels of spinach. The texture of the pakora was very good but the balance of spices was not quite right – the flavour was a bit flat. 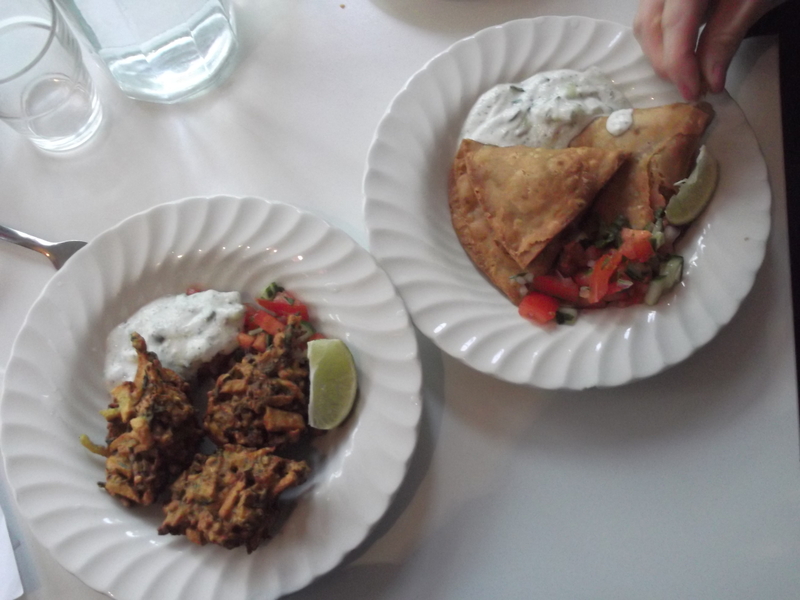 Both starters were served with Raita – a fresh mix of cucumber, mint and yoghurt – this was a nice change from the wholesale-bought electric pink sauces served up in high street curry houses. 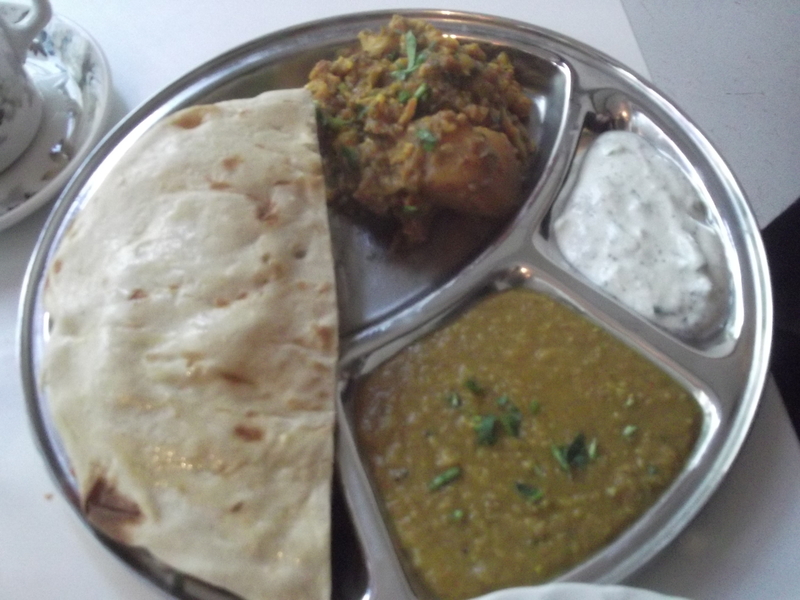 I also sampled the vegetarian thali which centered on a beautiful potato and cauliflower curry – the cauliflower had broken down so it formed a thick sauce around the perfectly cooked and subtly spiced potatoes. The thali was served with a very flat naan (it resembled an undercooked chapati but the owner informed me that it was indeed a naan) – it was, unfortunately, very similar to the one and only naan I have ever cooked: cardboardy and better used as a frisbee. 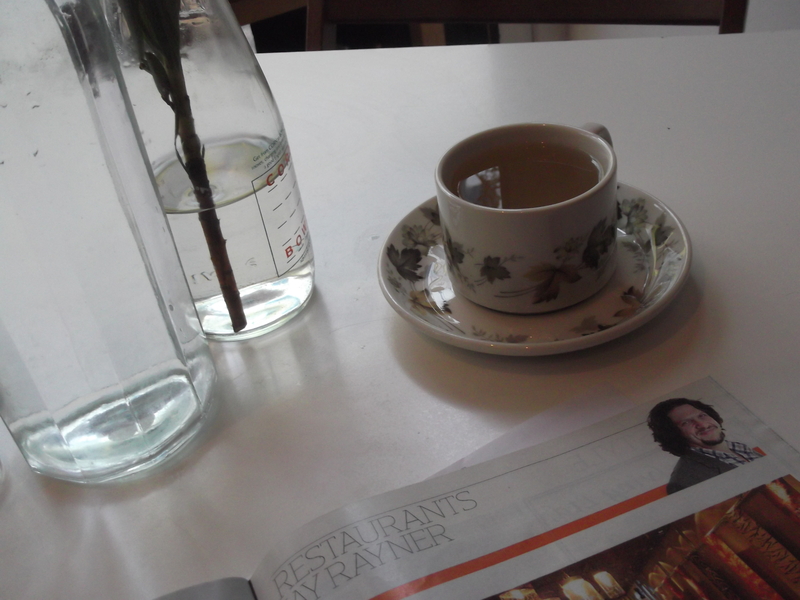 However this was the only negative point in an otherwise very enjoyable meal. Great value Pakistani street food – fantastic samosas and curries, but they need to improve their naan bread. Also see: comeconella and eatlovesnoodles.